Western culture SCREAMS at us that we are supposed to organize our lives around our resources. So when we find ourselves in a season of plenty, we still feel ok, no matter what else may seem to be falling apart. Yet, when we find ourselves in a season of financial want, our minds fill with worry and tension, even if everything else seems to be going right. This is why we naturally tend to order our lives around POSSESSION. We try to gain and keep as much as we can as quick as we can for ourselves…because our resources act as our security blanket. The more we acquire, the more comfortable we become. It’s also why GENEROSITY is so unnatural, and why it has to be intentionally worked at. We naturally feel like we are LOSING security when we are sacrificially generous. But even though it’s not natural, according to Jesus, living generously is actually a much “HAPPIER” way to live. And personally, I’m always prone to listen to the advice of the guy who died and got back up. This doorway. The view through this doorway wrecked me. As part of our “Hope for the City, Hope for the World” initiative, we have groups all over our community this week and next serving and helping our front line ministry partners. I dropped in to say hey to several of those groups who were serving this morning with “My Father’s House,” a family shelter in Concord, located in a local church. My Father’s House is the only family shelter in the county. This is HUGE because it keeps families who have fallen on hard times together, rather than being forced to be separated into men’s and women’s shelters. It’s an amazing organization that not only provides temporary housing and meals, but also provides and requires online budgeting, job training, and other resources to ensure families don’t end up there multiple times. Now, this organization is killing it. And our volunteers who were all over the place were absolutely getting it done. But this post isn’t about either of them. The thing that blew me away the most wasn’t the volunteers, and it wasn’t the ministry…it was the view through this doorway. See, growing up here in the south, I’ve seen doorways like this at the front of countless churches. But usually, when you look inside, you see pews, a choir loft, a baptistry and the other trappings of a traditional sanctuary. But not here. Here, you see the construction of what will in just a few short weeks be the housing units for 8 new families in need. See originally, Showers of Blessings Church had given My Fathers House a small space in the back to house their families. But eventually, because of the need, they expanded, and gave most of their Sunday School rooms to them as well. And now they’ve literally given up and handed over (rent and utility free) ALL of their space, including what was their auditorium in order to love on these families who so desperately need it. This church has given, and given beyond sacrificially, in order to accomplish what it is they believe God has called them to do. And the difference they’re making as a result is monumental. Now I’m not suggesting that every church in America hand over their buildings for the sake of housing the homeless. We’re all different parts of the body and are all called to different things. As people who claim to want to be like Jesus, how sacrificial do WE give of ourselves in order to do the work we know that God has called us to, even if we know it has no personal monetary or tangible benefit to us. Do we give up what’s convenient? OR like this church, have we leveraged EVERYTHING we have for the sake of bringing the Hope of Jesus to someone else. 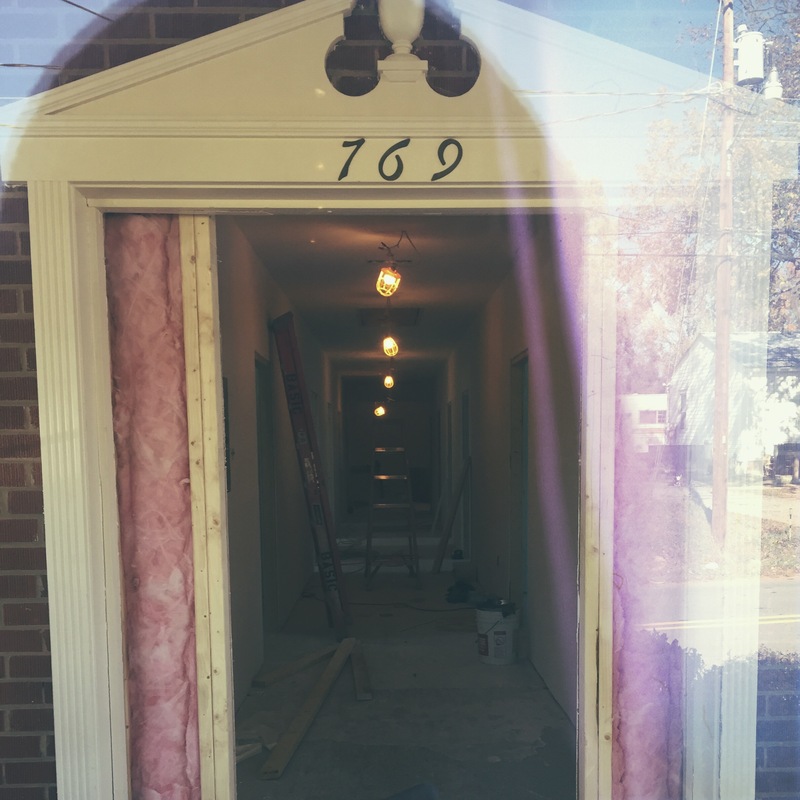 The view through this doorway…it wrecked me. Because it reminded me how much I have to give, and how often I am so unwilling to give it. This morning, I was reminded that whatever we have, it’s not ours. HE gave it to us. HE trusted us with it, so we could use it to bless others in Jesus name. 2 Corinthians 9:11-12 You will be enriched in every way so that you can be generous on every occasion, and through us your generosity will result in thanksgiving to God. This service that you perform is not only supplying the needs of the Lord’s people but is also overflowing in many expressions of thanks to God. There’s a beautiful exchange that takes place in Luke 5, when Jesus asks a tax collector to “follow” Him. The fascinating thing about the request, is that NO self respecting Rabbi would EVER ask someone caught right in the middle of a very public and shameful act of sin to follow them. Rabbi’s were looking for those that could effectively, and consistently bear their name, and someone caught in sin would certainly be an unlikely candidate . But Jesus didn’t see a tax collector…He saw a disciple. He didn’t label and identify this man based on his past mistakes, or even his present involvement. He saw his FUTURE POTENTIAL. He looked beyond his circumstance, and instead saw his capacity. It certainly wasn’t a popular move even among his own disciples. But Jesus knew that treating people based on who they were, rather than what they did, would be the catalyst to actually change the very behavior that other Rabbi’s would have taken issue with. The more I watch, and the more I begin to speak with those with who these well intentioned people are standing “against,” the more I’m convinced that not only what they are doing isn’t helping, it’s actually not very brave considering what real bravery looks like. Bravery is standing against the enemy…but people aren’t our enemy…they’re the mission. Helping them to live the way they were always created to live whatever the cost…that’s real bravery.